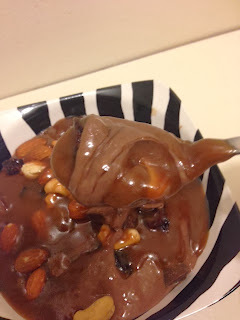 I don't mean to brag but doesn't this pudding look good? 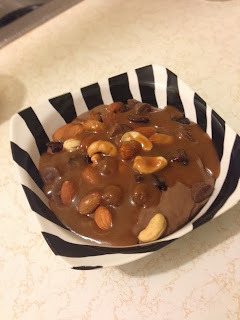 I ate this pudding with a sprinkling of trail mix and a slather of caramel sauce. It was very tasty. The salty, crunchy nuts, chewy raisins, and sweet, silky caramel sauce bumped this up to pretty darn tasty. In other news, I ran my first half marathon on Saturday. The last two miles were brutal. Before saturday, the most I had ever run was two miles. Next time I'll run 13 miles prior to the actual race. It was a good experience; I feel like a accomplished something worthwhile. I added a pumpkin pie spice to the pudding recipe off of a box of cornstarch. The ingredients are 1 tablespoon pumpkin pie spice, 2 cups milk, 3 tablespoons cocoa powder, 5 tablespoons cornstarch, 1/2 cup sugar, and 1 teaspoon vanilla. This is a simple recipe. I added all the ingredients into a saucepan. I stirred the ingredients together until there were no lumps of cocoa or cornstarch. I turned the burner on medium heat and stirred. 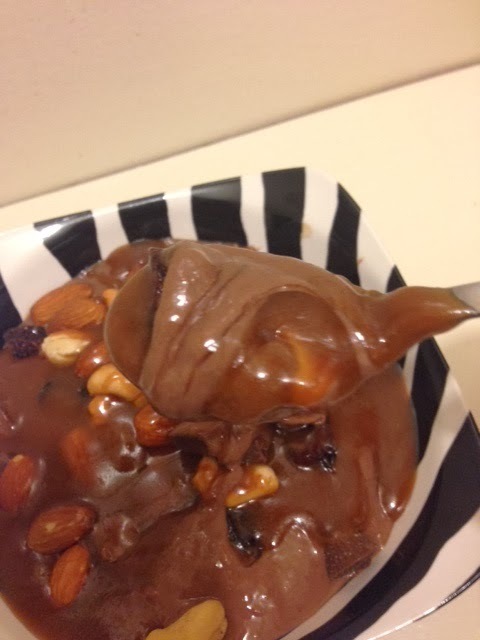 I stirred until the pudding was thick. I cooled the pudding off in the refrigerator for a few hours until it was cold. So simple yet still satisfying and a little decadent! I might have eaten a bowl for breakfast. The pumpkin spice is an excellent addition. It makes the pudding a little more seasonal and flavorful.